One of the most fascinating aspects of repeating an annual tour is the huge differences we experience from year to year. Southern Israel in March offers more dramatic changes than any other tour we have and each year a unique set of ground conditions often offers a complete contrast to the previous year – our two weeks in March 2010 was no exception. This year, no direct flights to Eilat meant that we had little choice but to take the long bus ride from Tel-Aviv south to Eilat. The journey took place in darkness, but had we been able to enjoy the views the verdant nature of the desert would have been immediately apparent. Exceptional winter rains brought a rare blooming of the desert and extensive green swathes throughout the south brought us great fortune with larks, but mixed success with the more common migrants. The desert was so green that many of the usual migrant traps didn't have the same magnetic lure for the regular common migrants. As a result, and for the first time that we can remember, some classic 'common' species such as European Bee-eater and Rüppell's Warbler never made it onto the trip list of either tour! But these were only minor gripes as both of our Israel weeks were highly successful. 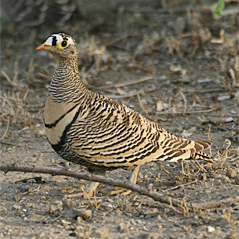 The first week recorded about 183 species including quality birds such as Black Vulture (two coming in to roost at the Dead Sea), Imperial Eagle, Lanner Falcon, African Swamphen, Nubian Nightjar, White-breasted Kingfisher, Blue-cheeked Bee-eater, Temminck's Lark, Pied and Finsch's Wheatears, Ménétries's Warbler and Desert Finch. The second week was completely different, especially in terms of weather. A cold front brought extensive flooding to the desert on the day that we should have visited the Dead Sea region. However we still netted 185 species, including a selection of highlights not recorded on the first tour: Striated Heron, Glossy Ibis (flock of 31), Booted Eagle, Montague's Harrier, (Siberian) Merlin, Little Crake, Collared Pratincole, (putative) Lesser Sand-plover, Pallas’s Gull, Crowned and Black-bellied Sandgrouse, Great Spotted Cuckoo, Oriental Skylark, Clamorous Reed Warbler, Asian Desert Warbler, Dead Sea Sparrow and Ortolan Bunting. In addition, the two tours combined recorded no less than eleven species of lark and nine species of wheatear! As last year, Black Scrub-robins were found on each tour with individuals seen at Yotvata and Eilat, and both tours also enjoyed a fine run of Caspian Plovers, Cyprus Wheatears and Cinereous Buntings. We also had one of the best displays of Pallid Harriers for years with many males watched hunting larks in the desert. It was also a stellar spring for Thick-billed Lark. Formerly a great rarity, numerous pairs were found setting up territory and nest building this year, evidently taking advantage of the temporary greening of the Negev and Arava deserts. With them came thousands of Greater Short-toed Larks, tens of Bimaculated Larks and numerous Temminck's Larks. A good find was an Oriental Skylark close to the Egyptian border at the Western end of the Ramon Crater, surely one of the most Westerly records in Israel as this species is mostly found wintering along the Arava Valley north of Eilat. I'm especially grateful to Nigel Warren for his excellent co-leadership and company on the Israel spring tours this year.